Ingrid Luche, Flying (after TD), 2012/13, dyptich, inkjet print on paper, colour pencil, nail varnish, wood frame, 59 x 42 cm ; 73 x 53 x 3 cm, Unique © Photo Marc Domage, Courtesy of the artist and Air de Paris, Paris. 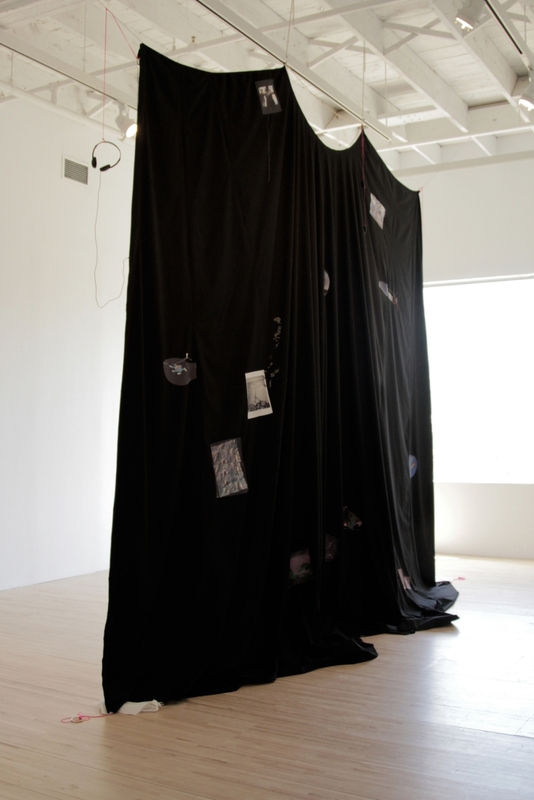 In some cases Ingrid Luche’s works take their inspiration directly from the exhibition context. Sometimes making play with persistence of vision relating to places she has known or simply fantasised, her intriguing pieces endlessly challenge our spatial perceptions, notably by generating a kind of intermediate time frame: a no longer extant present, a déjà vu future. Below a text regarding Ingrid Luche’s project for Artissima wrote by Fatima Hellberg for the catalogue of the fair. Tension (and its release) is a central currency in the work of Ingrid Luche. Anomalie temporelle, Amnésie temporaire is a suspended cape and drooping screen dividing the space in two, and a reflection on folded, looped and reversed time and space. This soft partition is layered with a pattern of images, connected with the disappearance of the Malaysian Airlines MH-370 flight and NASA’s Curiosity, the car-sized rover exploring the Gale crater on Mars. The two-sided surface is plotted with news-feed snaps and digital images: frag- mentary in nature – grainy, circulated representations of deep-sea debris and red planet vistas – remote to the point of abstraction. As a document, Anomalie temporelle, Amnésie temporaire returns to the material and conceptual remit of the loop, a connection between an interior and exterior that folds in on itself. In a science-fiction way, Luche is thinking about the possibility of folded or reversed space-time, a logic extended to the parameters of the gallery space. An important part of this ‘folding’ is the introduction of the screen, as a divider of space and a mode of concealment, but also the screen as a projection surface: a possible space for the experience of simultaneous times and movements. These are important considerations for Sans Titre (after TD), two photographic prints shot by Luche during a long-haul flight. The central motif is a screen on the plane, presenting the interior of that same flight to its passengers. This contained movement through time and its self-obser- vation on the screen, forms the first layer of representation in these two photographic works. The folds and ripples on the digital images are manipulations and a nod to a piece by Trisha Donnelly. The workings across the surface of the digital print are the half remembered marks and gestures, channeling the Donnelly work, whilst superimposing its outlines on the aircraft interior. In the environment formulated between prints and installation, there is a particular understanding of the gallery space: a soft-core institutional critique in which contingency and limping time be- come material (and materiality) to be reckoned with. 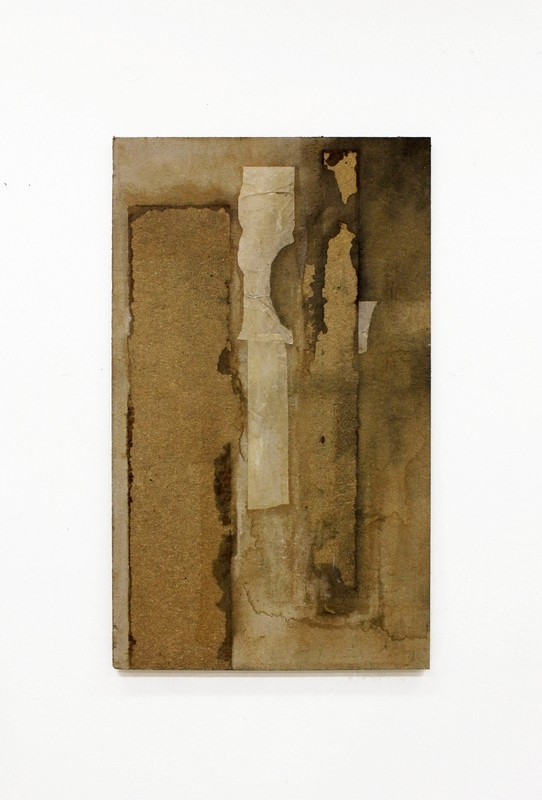 Ingrid Luche, Anomalie temporelle, Amnésie temporaire (12 novembre 2013 - 26 janvier 2014), 2014, mixed media on fabric 400 x 600 cm, Unique © All rights reserved, Courtesy of the artist and Air de Paris, Paris. She was born in St. Petersburg in 1984 and she is living and working between Gothenburg and Stockholm, Sweden. He is born in 1980 in Oxfordshire, Uk and he is living and working in London. Inspired by unorthodox systems of knowledge, Kit Craig translates ideas or concepts into forms, revealing the limit and potentialities hidden in them. […] we’re talking about the struggle to drag a thought over from the mush of the unconscious into some kind of grammar, syntax, human sense; every attempt means starting over with language. starting over with accuracy. i mean, every thought starts over, so every expression of a thought has to do the same. every accuracy has to be invented . . . . i feel i am blundering in concepts too fine for me. Anne Carson writes of language, but the logic and the desire to start over with ever-greater attentiveness, ever-greater specificity in time, says something about Kit Craig’s work with objects. It is an insistence on, and necessary ambivalence in the face of materiality, one that extends beyond the sculptural work per se: in Craig’s drawings, too, the agency and limitation of the object tends to come back - delicate lines and an undeniable fascination with weight, the removal of weight and the particular presence and temporality held and advocated by the thing. The result, undeniably so, is that the objects and drawings tend to look like tools, and like puzzles. This is a core element of Craig’s installation at Artissima, a total work featuring a floor-based sculptural installation and drawings. The room stands like a collapsed sculptural display: the objects in the piece exist as inserts within the raised floor and as representational drawings on the walls. It is a sculptural show, really, but without sculpture. 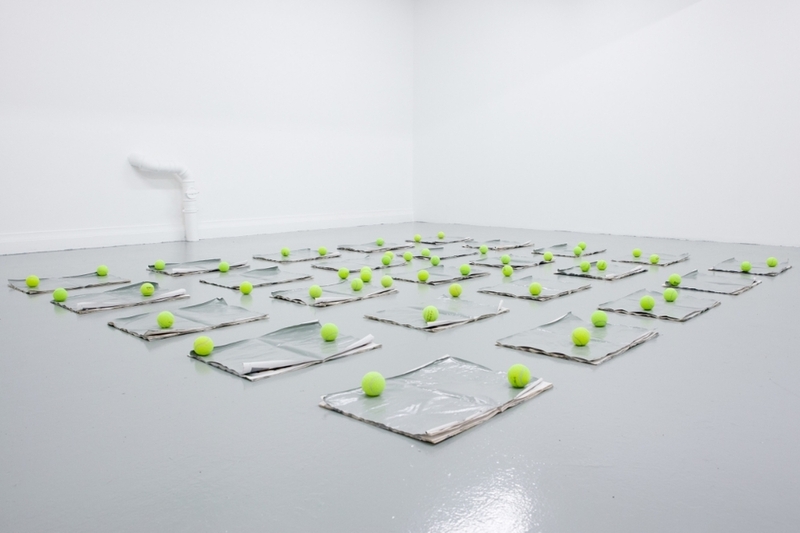 Here the fetish and desire for the object become perpetually delayed, for we see an inventory and system of objects that share an emblematic status as ‘it’ whilst insisting on flatness – the flatness on the wall, and under our feet. A striking quality which underpins this display, like much of Craig’s drawing and sculptural work, is a particular take on medievalism, both in the look of the work and its collapsed sense of perspective, and in a more metaphysical sense: in the insistence on an almost redundant, internalized logic. The temporality of this flatness and sense of charge is one that pulls: on the one hand it evokes a spirituality and vertigo-inducing perspective of past – heaps and depths of past time - and on the other the choices have something to do with the future. A sense of and feeling for futurity played out in a present obsessed by the experience and limitations of flatness. Iza Tarasewicz was born in 1981 and raised in a small village near Bialystok, Poland. She graduated from the Faculty of Sculpture and Performing Art at the Academy of Fine Arts in Poznan, Poland in 2008. Her works serve as temporary conduits for a meeting of substances, energies, locations, temporalities, intonations, and concepts, which the artist identifies as only events in a continuous series of material and symbolic interactions. Her sensitive examination and transformation of materials is a complex interpretive exercise that often manifests in objects, spaces, graphs, drawings, sounds, videos, and performative actions. Her objects and arrangements are base things that resist the binary of natural and artificial, joining together quotidian, ignoble, or emblematic stuff such as raw pigment, rubber, clay, plaster, concrete, gold, steel, glass, tar, animal fat, skin, fur, intestines, plasticine, plant fibers, dung, and ash. Often bordering on hylozoism (the concept that all matter and non-matter has life), each object or arrangement is invested in exploring the affecting nature of its material makeup and challenges the viewer to consider both the vital energetic relationships in all things and the inextricable interrelation of chaos and order. Her investigative practice distills, combines, deconstructs and redirects materials so as to rediscover hidden aspects and relations, while equally signifying a contingency or deficiency in rational, human understanding to access such properties. In the beginning of 2016, Tarasewicz will attend the GeoAIR Residency in Tbilisi, Georgia, where she will produce a site-specific project. 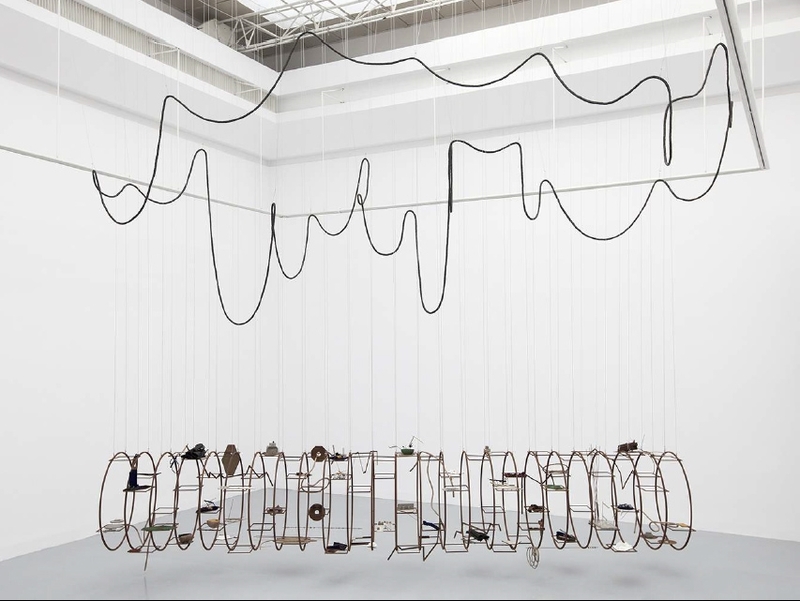 In the Spring of 2016, Tarasewicz will attend the International Artists-In-Residence Program at MeetFactory in Prague, Czech Republic, where she will further develop her project Turba Turbo and will use the structure as a display system for the presentation of a curated group exhibition featuring Czech and international artists. In the Fall of 2016, Tarasewicz will visit Brazil with support from the Adam Mickiewicz Institute to research and produce a publication related to her ongoing Mazurka Project.